We’re down to crunch time here, and if you STILL haven’t bought your significant other a great Xmas prezzie, it’s ok–as long as you act fast. You have until December 31, to buy discounted tickets to the 17th Annual San Luis Obispo International Film Festival (SLOIFF) March 9-13, 2011. What film buff wouldn’t be thrilled with such a thoughtful gift? 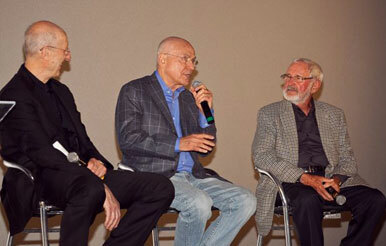 2010 King Vidor Award recipient Alan Arkin, and former recipients James Cromwell and Norman Jewison share stories and answer questions from the audience. Choose from a full roster of special events, Filmmaker Mixers to Red Carpet Receptions, where you’ll be able to get all chummy with Hollywood celebs while enjoying award-winning wines and gourmet grazing courtesy of the best local restaurants and wineries. 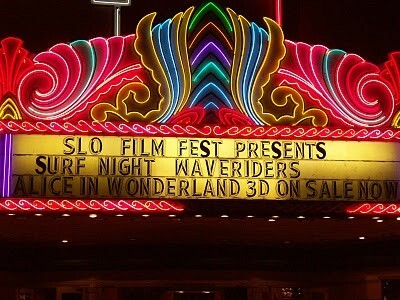 Two popular events that will be making a return engagement are Surf Nite, which features an epic surf flick with professional surfer guests on board and the King Vidor Award Night honoring a top Hollywood personality (to be announced early 2011). The amazing Alan Arkin was last year’s recipient. Thanks to a grant from the Academy of Motion Picture Arts and Sciences, SLOIFF will present “Chicks ‘n Flicks” an exciting new program about Women in Film: Past, Present and Future. Through film, panel discussions and hands-on workshops, “C ‘n F” will examine the role women have played in the film industry during the last one hundred years. “We are so delighted to have the support of the most respected and venerable film organization in the world,” said Festival Director, Wendy Eidson. “This program will add an exciting new dimension to the 17th Annual SLOIFF.” Eidson worked as an assistant director for many years before moving to San Luis Obispo, and understands the challenges women filmmakers face in a male-dominated industry. “I’m really looking forward to the panel discussions that are sure to be provocative, fun and will relate to issues shared by many women still working for equality in the workforce,” said Eidson. And San Luis Obispo is where exactly? For those of you who aren’t exactly sure where San Luis Obispo is located, it’s about midway on the coast between San Francisco and L.A. The Film Festival will be roving around all over the county with screenings in eclectic venues such as the nation’s original solar-powered theatre and a 1940s art-deco Fremont Theatre. Recently recognized as “the happiest place in the country” there’s plenty to do in SLO (as the locals fondly refer to San Luis Obispo) between films: from barefooting it to the sandy beaches, to visiting world-class wineries, to scouting out the best paths for hiking and biking and if the weather is nice, some stellar surfing. Wind down at one of the local spas or hot springs before getting glammed up for the night. City slickers will enjoy shopping historic downtown and checking out the local landmarks – like SLO’s eccentric bubblegum alley. There are many festival passes available at various price points, with EARLY-BIRD DISCOUNTS available until DECEMBER 31, 2010. I don’t know if your sweetie’s been naughty or nice, but I’d suggest springing for the big daddy Movie Mogul Pass to ensure good behavior for the coming year. Just look at all it offers! FULL ACCESS pass allows admission for one person to all regular Festival screenings, workshops/panels, all parties including VIP events. * Also includes admission to Best in the Fest award-winning films screenings. Back by popular demand! All purchasers of Mogul Passes will also receive a Wine Tasting Pass, good for complimentary wine tastings at the following participating SLO County wineries: Baileyana/Tangent Winery, Claiborne & Churchill Vintners, Derby Wine Estates, Frolicking Frog Cellars, J & J Cellars, Pithy Little Wine Company, Rangeland Wines, St. Hilaire Vineyard (at Zoller Wine Styling), Sculpterra Winery, Talley Vineyards, Tolosa Winery. For more info about ticket prices (and the Early Bird Special) film schedule, the parties and special events, please visit the San Luis Obispo International Film Festival website. P.S. The San Luis Obispo Chamber of Commerce’s, VisitSlo.com website can help you plan tours and wine tasting and SLO Vacations will be happy to hook you up with hotel reservations.